The male India Blue Peafowl, commonly known as the Peacock, is known for its amazing, extravagant display of iridescently colored feathers. However, the females, or peahens, even though less of striking than the male of the species, are quite beautiful themselves. 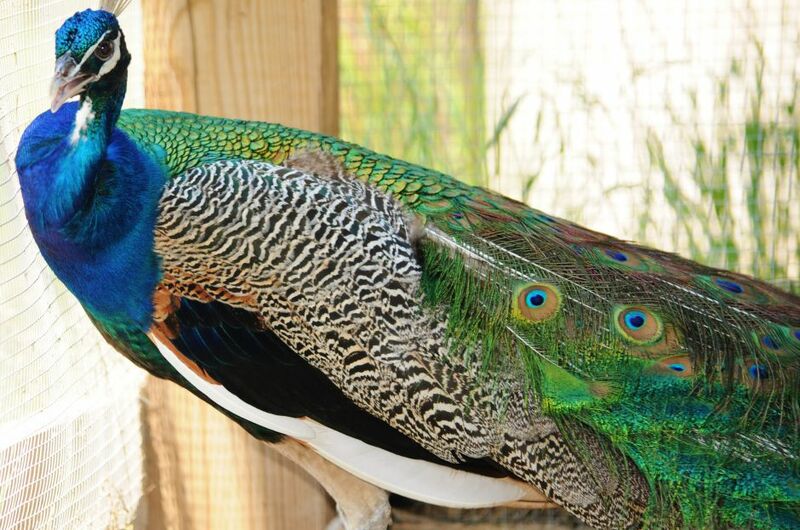 The tail feathers of Peacocks spread out in a distinctive train that is more than 60 percent of the bird’s total body length and display colorful “eye” markings of blue, gold, red, and other hues. The large train is quite impressive and is used in mating rituals and courtship displays. It is displayed as a magnificent fan that reaches across the bird’s back and touches the ground on either side. The peacock displays his beautiful train with proud abandon, which can be quite breathtaking to behold. Females are believed to choose their mates according to the size, color, and quality of these beautiful feathered trains. 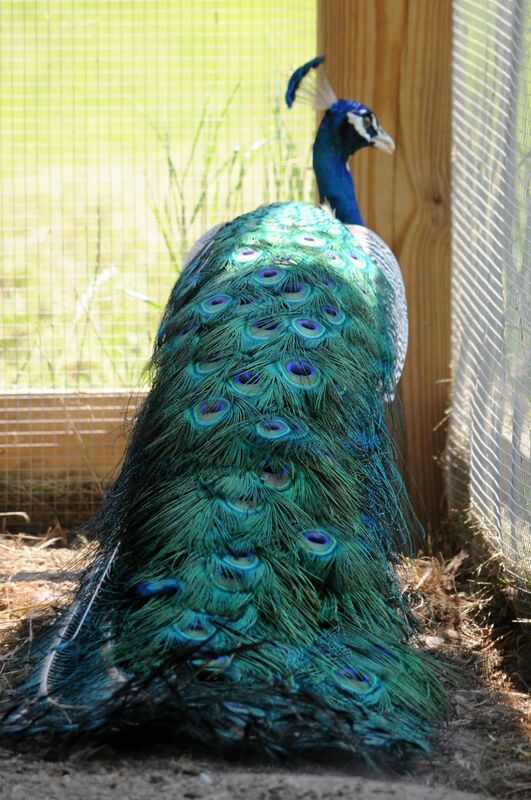 The term “peacock” has commonly been used to refer to birds of both sexes, however, only males are peacocks. Females are peahens, and together, they are called peafowl. Their young are called peachicks. Males may gather harems of several females, each of which will lay three to five eggs. Wild peafowl often roost in forest trees and gather in groups called musters, or ostentations. Peacocks are ground-feeders that eat insects, plants, and small creatures. There are two familiar peacock species. The India Blue peacock originates from India and Sri Lanka, while the green peacock is found in Java and Myanmar (Burma). A more distinct and little-known species, the Congo peacock, inhabits African rain forests. Riley’s Ranch is home to Mr. and Mrs. Peabody, a handsome pair of pure India Blues, with their 6 peachicks who were born in June of 2017. These peachicks are for sale. We also have a free ranging pair of Java Greens, who have made themselves quite at home, enhancing the farm with their iridescent beauty.